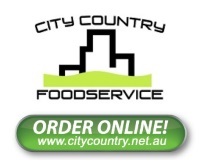 City Country Foodservice - Complete Service providers. City Country Foodservice is a family run business established in 1981. We are dedicated to supplying superior products from our extensive range at competitive prices with family quality service. We are dedicated to providing a high standard of professional, personal service to a variety of food service operators such as clubs, pubs, hotels, motels, hospitals, nursing homes, institutions, schools, canteens, cafes, restaurants, fast food outlets, caterers, contract group and franchise organisations. We pride ourselves on the relationships we have established with our suppliers and most importantly, you the Customer. Our dedicated staff are highly motivated and are only to happy to help you with any of your requirements. City Country is a proud member of the Countrywide Network. The Countrywide Network is Australia's largest national group of independent foodservice distributors offering the best of local knowledge and service. Countrywide's national buying strength allows us to offer you professional, personal attention at a competitive price. City Country is a Parmalat Australia Franchisee. Parmalat Australia specialises in the production of branded milk and dairy products and is one of the major manufacturers of milk, yoghurt and fresh dairy products in Australia. The company has an impressive stable of well recognised, popular milk and dairy product brands. These include Parmalat, Pauls, Trim, Rev, PhysiCAL, Breaka, Ice Break and Vaalia.